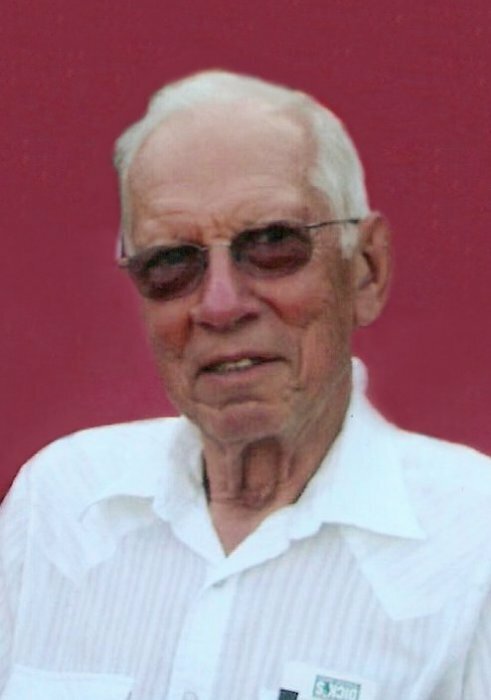 Obituary for Harold A. Ruesler | McCombs Funeral Home Inc.
Harold A. Ruseler, 87, of Jackson, passed away Thursday, August 16, 2018, at Ratliff Care Center in Cape Girardeau. He was born October 15, 1930, in Friedheim, Missouri, to Arthur and Anna C. Dickman Ruesler. He and Rose Mary Bohnert were married October 20, 1956, at Trinity Lutheran Church in Friedheim, also the church of his baptism and confirmation. Harold was raised on the family farm in Friedheim and attended the former Trinity Lutheran School. He was a PFC in the U.S. Army, serving honorably from October 31, 1951 to October 12, 1953. He was stationed in Germany and was a telegraph operator in the signal corps. Harold drove a truck and was a warehouse man, working 30 years for the former Wettereau Foods – SuperValue, Inc., retiring in 1994. He was active in Teamsters Local 574, serving as a union steward and on the board. He was a longtime member of St. Paul Lutheran Church and previously enjoyed singing in the choir. Loving survivors include his wife of nearly 62 years, Rose Mary Ruesler of Jackson; three children, Keith (Marie) Ruesler of Jackson, Kim (Eric) Weir of Fenton, Missouri, Kendra Ruesler of St. Louis; six grandchildren, Annette (Mike) Engelen, Leah (Brad) Lappe, Natalie and Zackary Ruesler, and Brittney and Brandon Weir; seven great-grandchildren, Kelby, Cora, Trustin, Kamden, Ella, Angelo and Lucille “Lucy”; a sister, Virgie (Harold) Schubert of Perryville; a brother-in-law, Michael (Judy) Bohnert of Perryville; and several nieces and nephews. He was preceded in death by his parents; and four siblings, Wilbert (Ida) Ruesler, Norman (Phyllis) Ruesler, Rupert (Betty) Ruesler, and Verna (Marvin) Best. Visitation is from 4 to 8 p.m., Monday, August 20, 2018, at McCombs Funeral Home and Cremation Center in Jackson, and from 9:30 a.m. to service time, Tuesday, August 21, 2018, at St. Paul Lutheran Church in Jackson. The funeral is at 10:30 a.m., Tuesday, August 21, 2018, at the church, with the Rev. Eric Longman officiating. Burial and military honors will follow at Russell Heights Cemetery in Jackson. The family appreciates memorials to the Music Ministry of St. Paul Lutheran Church in Jackson; the Music Ministry of Peace Lutheran Church, 737 Barracksview Road, St. Louis, MO 63125; Lutheran Hour Ministries; or the Jackson Ministerial Alliance Food Pantry.